Lowest Prices for the best rv cargo from Lippert Components. 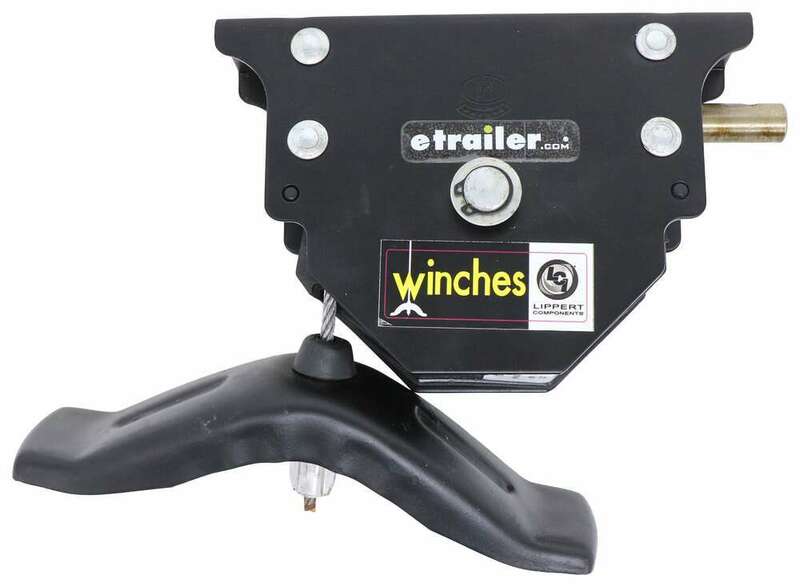 Lippert Components Spare Tire Winch with Offset Cable part number LC159056 can be ordered online at etrailer.com or call 800-298-8924 for expert service. The Lippert Components spare tire winch is the perfect bolt-on solution for your spare tire carrier. 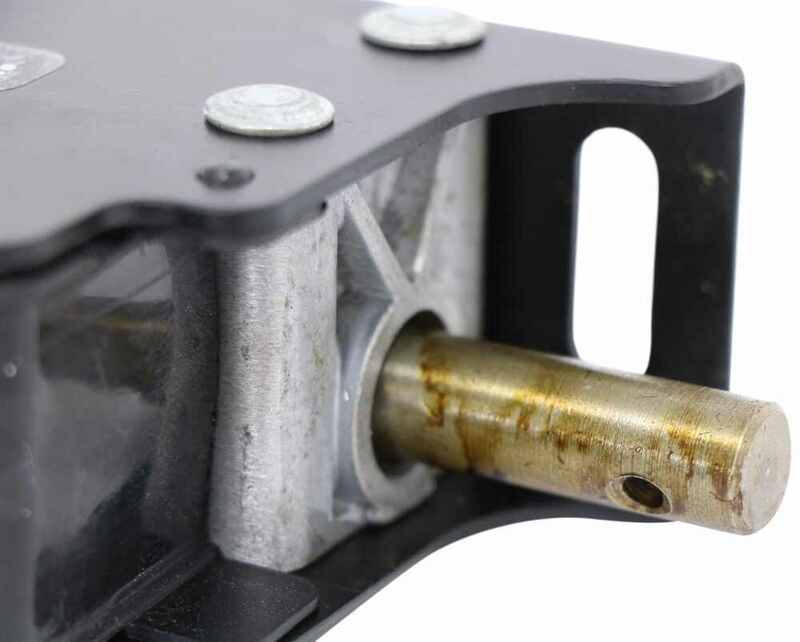 Simply bolt on the winch (hardware not included) under your trailer or RV. The offset cable allows for a more compact design which better utilizes leverage. 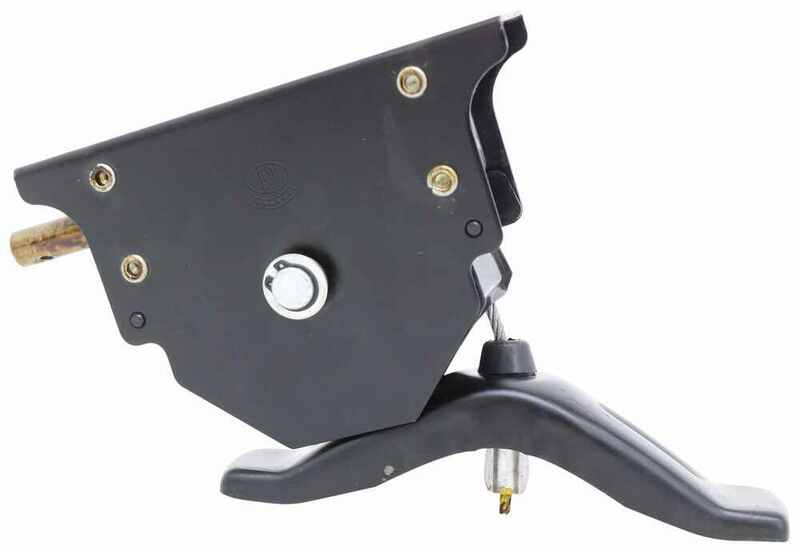 The sturdy Roadmaster spare tire carrier allows you to carry a spare tire for your RV or motor home while retaining use of your hitch for mounting accessories or flat towing. Holds 16" to 24-1/2" spares with any bolt hole pattern. Speaker 1: Today we're taking a look at the Lippert Component Spare Tire Wench with offset cable. The spare tire wench is the perfect bolt-on solution for your spare tire. This unit easily mounts or bolts to your trailer or RV, and it bolts directly to your trailer's or your RV's chaise or frame. Mounting hardware not included, but it does have the two pre drilled mount holes here at the top for easy installation.Then we have the offset cable, which allows for a more compact design, which better utilizes leverage. The cable measures around 6 feet long. You will need to use a crank handle to raise and lower the spare from the wench. 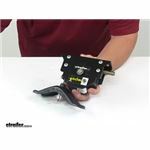 Crank handle is sold separately and available at Etrailer.com. 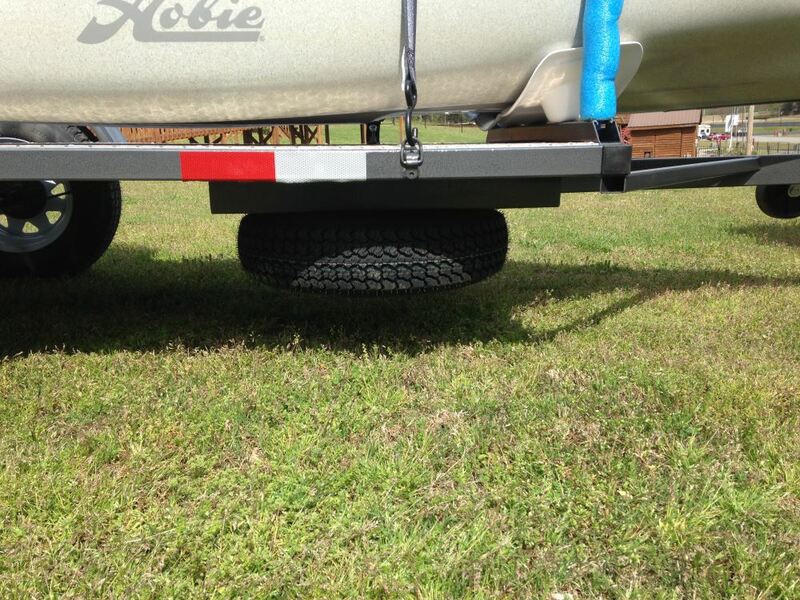 This can be used on RVs, trailers and trucks as long as you have enough clearance for a spare tire. It's made from a durable steel construction with a really nice powder coat finish to help resist rust and corrosion.Basically the way it works is you would lower the bracket, right here. Lowing the unit that would extend the cable. You lower the bracket to the spare tire. You'd place this in the pilot hole of the wheel, and then you would raise it up. This would grab onto the wheel, and it would raise your spare into position.A few measurements to go over with you real quick. The overall length of the contact portion here at the mounting area is about 6-1/4, by 1-3/4 inches. The body top to bottom measures about 4-1/4. The bracket edge to edge measures 7 inches by 1-3/4 to 1-13/16 inches, right in that area.That's going to do it for today's look at the Lippert Component Spare Tire Wench offset cable.. 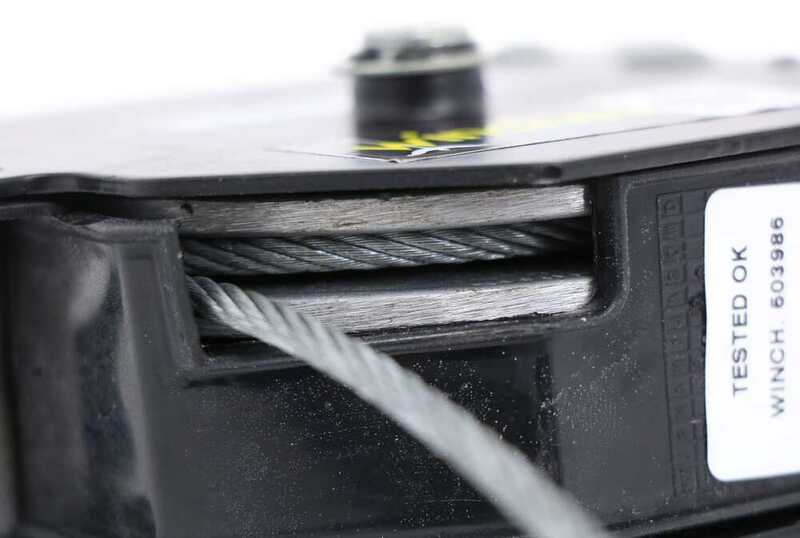 The Replacement Crank Extension for Lippert Components Spare Tire Winch Assemblies # LC1315411, which is a replacement for Lippert Components Spare Tire Winch with Offset Cable # LC159056, has an inside diameter of 0.50 inches and the hex has a 0.75 inch diameter, as you can see in the accompanying photos. I've added links to a video review of the crank extension and spare tire assembly for you to check out. If you check out the diagram I attached of the side of the Lippert Components Spare Tire Winch # LC159056 that mounts you can see that the distance between the mounting hole locations is 5-1/4" on center. I reached out to my contact at Lippert who said that the handle # LC1315411 is 35-1/2" long and would work with this winch. 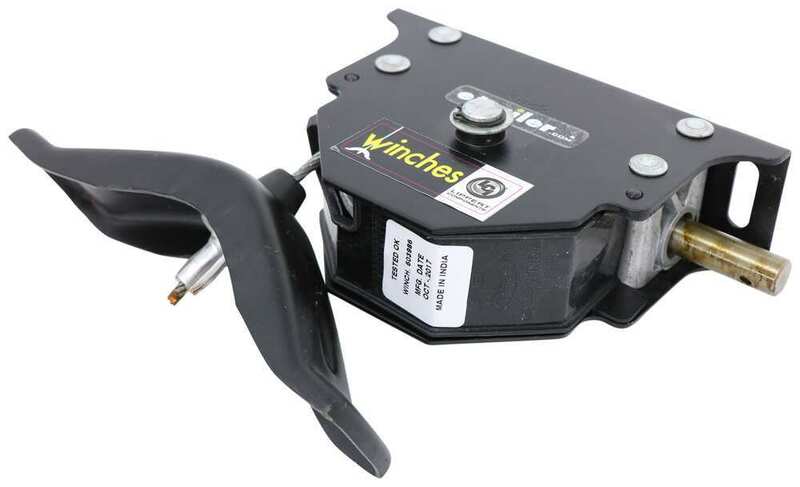 Do You Have a Spare Tire Winch Rated for 200 lb Tire and Wheel? The base of the Lippert spare tire winch, part # LC159056, from where it bolts to the frame to the bottom is 4-1/4 inches. I've also linked a review video on the winch that shows off some other dimensions. For a crank handle use part # LC116112. 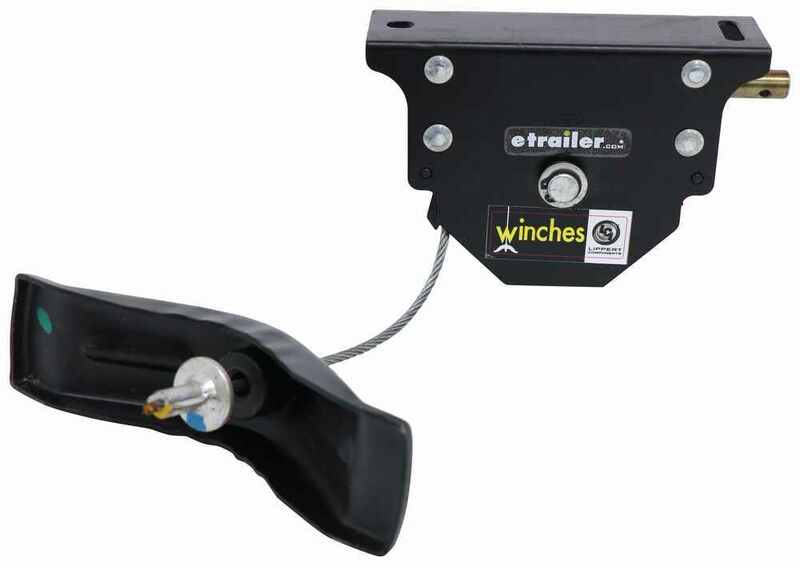 Although I am not quite sure what spare tire winch came on your 2007 Coachmen Freelander Class C Motorhome, we do have the universal Lippert Components Spare Tire Winch with Offset Cable # LC159056. Simply click on the hyperlinked part number to order it through our website. I have attached a review video and a diagram demonstrating the mounting dimensions for you to reference. Lippert Components Spare Tire Winch # LC159056 has a 1/2-inch round crank fitting and uses Replacement Crank Extension # LC1315411. One end of this part has a 3/4-inch hex shape to mate with Crank Handle part # LC116112 which also has a 3/4-inch fitting. I measured this myself to make sure. If you have a crank handle with a 3/4-inch hex fitting it should work fine. The offset cable for the Lippert Components Spare Tire Winch # LC159056 that you referenced is 6 feet long. 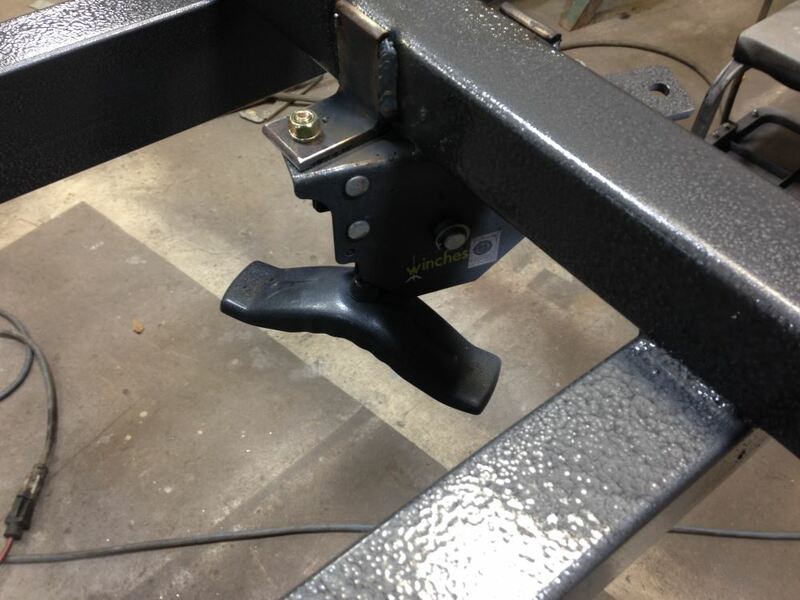 This is designed to bolt under your trailer or RV. Yes, the Lippert Components Spare Tire Winch with Offset Cable part # LC159056 can handle your 126 lb wheel/tire as it has a 150 lb weight capacity. Don't forget the Crank Handle for Lippert Components Spare Tire Winch part # LC116112. The Lippert Components Spare Tire Winch # LC159056 that you referenced is currently the only item of its type that we offer. For use with this we offer an extension # LC1315411 and a crank handle # LC116112. We do have other types of spare tire carrier like hitch mount # C31006 and bumper mount # TR-1 but I realize neither of these replaces the convenience of being able to stow your spare under the coach. Does Lippert Spare Tire Winch Lock or Hold in Any Position?